Very nice... are there any images that show star trails? This is a fascinating and irritating pair. How can it be that they show no tidal distortions when they are practically on top of one another? 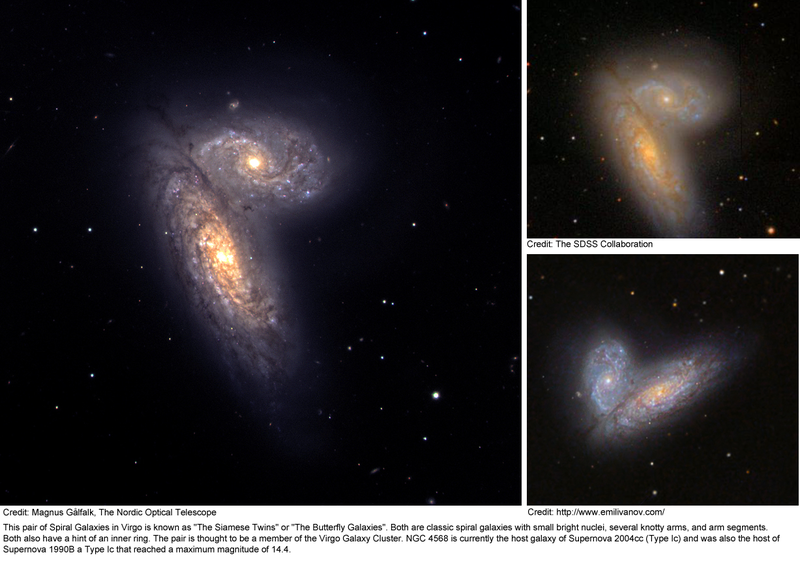 I found a great set of three different pictures comparing the appearance of these "Twin Galaxies" in Virgo. I can't post it here, because it is too large, 1.1 MB. I'm posting it here as a link anyway, but be warned: Don't open it if your computer, laptop or mobile can't handle that many bites. The 1.1 MB picture collection can be found on this page, which I recommend, if you want to see some more fascinating interacting galaxies. Anyway. NGC 4567 and 4568 are two calm and sedate-looking spiral galaxies of unremarkable colors sitting right on top of one another doing nothing in particular. Don't tell me they are forming a lot of stars! I must commend Johannes Schedler and the CHART32 Team for really teasing out some undeniable pink splotches in both galaxies, but particularly in NGC 4568, the flat-looking one, thereby proving that they do indeed form some stars. Note that NGC 4567, the face-on one, has a large outer spiral disk where no star formation is taking place. Only the inner disk is blue from young stars. But there is no major ongoing star formation there at all. To me, NGC 4567 looks like a relatively gas-poor galaxy, possibly because it has lost much of its gas due to interaction with the hot intracluster medium of the Virgo Cluster. Perhaps NGC 4567 could be a poor cousin several times removed of spectacular gas-losing spiral D100 in the Coma Cluster? Now that I'm at it, I have to show you some possibly related, yet not related, galaxy pairs. I'm talking about overlapping, non-interacting galaxies. A famous one is NGC 3314. The overlapping galaxies are overlapping so perfectly that they can only be told apart by calling them NGC 3314 A and NGC 3314 B. But they are well separated and aren't interacting at all! The 2MASX J00482185-2507365 occulting pair is a pair of overlapping spiral galaxies found in the vicinity of NGC 253, the Sculptor Galaxy. 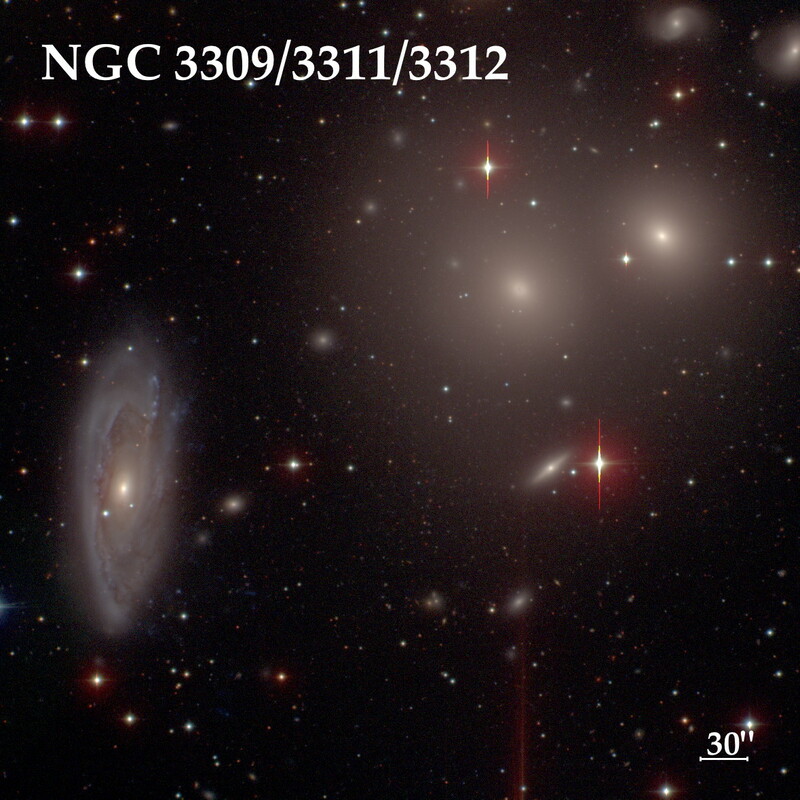 Both galaxies are more distant than NGC 253, with the background galaxy, 2MASX J00482185-2507365 (PGC 198197), lying at redshift z=0.06, about 800 million light-years from Earth, and the foreground galaxy lying between NGC 253 and the background galaxy (0.0008 < z < 0.06). This pair of galaxies illuminates the distribution of galactic dust beyond the visible arms of a spiral galaxy. The heretofore unexpected extent of dust beyond the starry limits of the arms shows new areas for extragalactic astronomical study. The dusty arms extend 6 times the radii of the starry arms of the galaxy, and are shown silhouetted in HST images against the central and core sections of the background galaxy. AM 1316-241 is the name given to a pair of overlapping galaxies photographed by the Hubble Space Telescope. Notable for the visible dust revealed by the back light from the more distant galaxy. Until recently, the extensive dust far outside the visible portion of a galaxy was not known to exist. But, uh-oh, this last pair may indeed be interacting. Don't open it if your computer, laptop or mobile can't handle that many bites. Just so you know, a bite is something you take out of a sandwich. A byte is something that a computer uses. They sound the same but are spelled differently. Also, I love the images that you posted. I thought the word looked strange when I wrote it. Thanks for setting me straight! And thanks for praising the pictures I posted! For Ann; Is this what you wanted to show? One of the things I love about the really large pictures APOD posts is that you can often find interesting things in the background. For example - at about pixel 75,750, there's a sharp point of light surrounded by lots of fuzziness. It doesn't exactly look like the normal elliptical/spherical galaxy, since the core brightness is too sharp, so I'm guessing it's *maybe* a comet? Or maybe it's just a chance alignment of a star and an elliptical galaxy - I dunno. Kinda neat, though. The twin galaxies look like they may be conjoined! There are several galaxies in today's APOD; you may be looking at one of them! Thanks, Orin! Yes, it is! I found that one strange, too. I know that David Malin once described a spheroidal dwarf galaxy with a sharp central light point as a "nucleated dwarf". So maybe the weird object in today's APOD is one, too. But it doesn't really look like one. The faint halo looks too much like a ghostly gas cloud of some sort, not like a collection of stars. Admittedly though, the halo of the weird object is the same dull grey color as the outer arms of NGC 4567, which are certainly made up of old stars. I think this is the spot you're talking about. I screen captured this from a 500% blowup of the image, then increased the brightness and contrast to bring out a little more detail. Seems like it could be a distant elliptical galaxy. This image would look so much better north up! This is the low surface brightness dwarf galaxy PGC 42075. There seem to be a lot of these in Virgo. I guess this is what you get when all star formation ceases and all that is left are old stars. Thanks starsurfer. So being a dwarf galaxy closer than my hypothesized distant elliptical, I suppose that makes the bright core more reasonable. As well, I suppose that during a long exposure a pinpoint of bright light from the core gets washed over more pixels, creating this rather odd looking bright core. How am I doing at supposing? Thanks for identifying it, starsurfer. Rob, a distant (and therefore large and massive) elliptical galaxy wouldn't look like that. It wouldn't have such a bright concentrated center and such a diaphanous "body". The picture at left shows galaxies just north of the twin galaxies in today's APOD. There are two massive elliptical galaxies there and a number of "anemic" spirals, which are losing their gas and their ability to form new stars. As you can see, there is not a single galaxy here that looks like a bright point surrounded by a ghostly halo in remotely the same way as PGC 42075. Massive galaxies don't look like that, unless they are low surface brightness galaxies, like Malin 1. Low Surface Brightness Galaxy Malin 1. No, I take that back. Even massive low-surface galaxies don't look like that. Malin 1 is a giant low surface brightness (LSB) spiral galaxy. It is located 1.19 billion light-years (366 Mpc) away in the constellation Coma Berenices, near the North Galactic Pole. As of February 2015, it is arguably the largest known spiral galaxy, with an approximate diameter of 650,000 light-years (200,000 pc), six and a half times the diameter of our Milky Way. It was discovered by astronomer David Malin in 1986 and is the first LSB galaxy verified to exist. Its high surface brightness central spiral is 30,000 light-years (9,200 pc) across, with a bulge of 10,000 light-years (3,100 pc). The central spiral is a SB0a type barred-spiral. I guess PGC 42075 is a low surface brightness nucleated dwarf spheroidal galaxy after all. Edit: Alcor just informed me that the NGC 3309/3311/3312 trio is nowhere near the overlapping twins in Virgo! Thanks, Alcor! Last edited by Ann on Sat Feb 02, 2019 6:35 am, edited 1 time in total. Malin 1..what an incredible structure !!! I would love to see a clearer view of the obviously wild 3D perameters. There's an interesting object just to the right (2 o'clock) of NGC 4567. Looks like a very small spiral galaxy. Of course it might be very far in front or behind the Butterfly. they are well separated and aren't interacting at all! BTW - thanks, Ann, for the really excellent photo of NGC3314A & B! Absolutely magnificent! NGC 1232 with NGC 1232A at left. Photo: ESO. Your object looks like a barred spiral galaxy to me. And since it is so small, I'd say it has to be pretty far in the background, because such miniature-sized spiral galaxies hardly exist - with perhaps one exception. Our Milky Way is just a spiral galaxy, but NGC 1232 here is a grand spiral galaxy, its diameter twice as long as ours. Everything is bigger in NGC 1232, including the giant satellite galaxy warping it out of shape. So NGC 1232A is a tiny barred spiral galaxy, but it is a giant tiny barred spiral galaxy in view of its satellite kind! The spiral galaxy you showed us near the twins NGC 4567/4568 doesn't look like it belongs to the twins at all. So it is almost certainly a background object. http://cfht.hawaii.edu/en/news/Malin1/ I'm intrigued by the size of this galaxy! (Not sure how to make a link active here) Some interesting reading. Whatever this is, it isn't catalogued in either the SIMBAD or NED databases. Is that where you found PGC 42075, starsurfer? How did you search for it?